We are an authorized Kenwood Car Audio dealer. 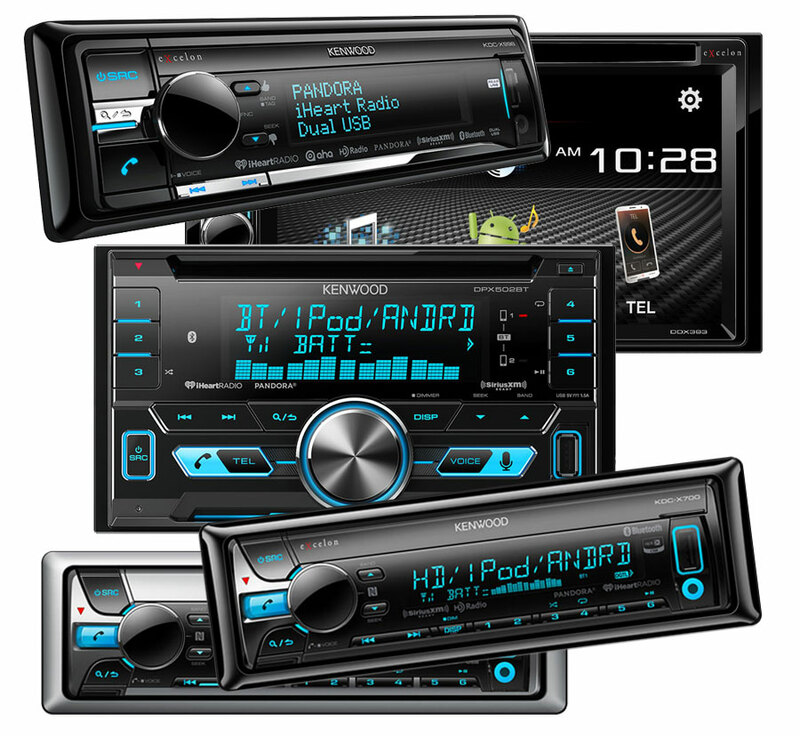 We carry a full line of Kenwood Car Stereo product. Kenwood Car Radios begin under $80. Get a great price, local warranty support and have it installed today. For Kenwood video touchscreen car radios click here. The Kenwood car stereo and Kenwood CD player represent the best in todays offerings of in dash receivers with the latest in iPhone and Android connectivity + HD Radio, SiriusXM option and Bluetooth available. Excelon is Kenwood’s Top-of-the-Line. All Kenwood eXcelon car stereos include a manufacturer’s Two Year Parts and Labor Warranty! Kenwood car stereo is on display in our showroom for you to see and hear. If you like what you see, we can usually install it for you while you wait. We carry the full line of eXcelon car stereo models plus some regular line lower priced Kenwood models. As a result we have a really great selection to choose from. Compatible with various internet radio apps such as PANDORA, iHeartRadio, Spotify. You can also enjoy built-in optional SiriusXM broadcasts. Easily stream music from your phone or other Bluetooth devices directly to the receiver. Functions such as track name display and track search are also available from the receiver. The receiver will allow the voice dialing feature found on most smartphones to work through Bluetooth. Questions about Kenwood Car Stereo? Remember, car stereo receivers purchased online have no local warranty. Since we are authorized dealers for the brands we sell, we give a local warranty and local product supportwhen you buy from us, especially if we install your purchase.